According to the Bank of England’s latest assessment, the uncertainty of the last few months has left the UK in the weakest growth environment since the crisis – and those scars will linger. It confirms that both growth and inflation at the end of last year is weaker than it previously thought and it is looking for growth of 1.4% in 2018. Brexit uncertainty has weighed on both business investment and household activity – although the latter to a lesser degree. While the Bank’s own investigations reveal about half of businesses have put contingency plans in place, spending in other areas has suffered. Growth in the US, China and in particular the eurozone (which was only about as half as strong as the Bank previously predicted) is also weighing. So as we eye the UK’s exit from the EU in just 50 days time, the backdrop is pretty subdued. And the Bank’s best stab is that it doesn’t get much better quickly, even if a deal is struck in the coming weeks. Its assumption is that the UK exits on March 29 with a deal and – crucially – that there is a smooth adjustment to that new era: That households, businesses and markets take the new arrangements in their stride. The caution currently surrounding spending. – corporate and by consumers – could ease – the so-called deal dividend. Even in that case, which, realistically, would appear to be a best-case scenario for growth, the economy would expand by just 1.2% in 2019 – the weakest rate in the post crisis era. There is in fact, the Bank says a 1-in-4 chance the economy dips into reverse by the autumn. The decline in business investment it thinks will linger, contracting by a further 2.75% this year, damaging productivity. And a weakness in our trading partners would cause export growth to drop to just 1% this year, less than half the rate previously expected. But even the Bank acknowledges the Brexit outcome could be very different. What if there is no deal, or heightened uncertainty? It’s had a stab at assessing how the economy might react. And it’s clear from that it would face a dilemma. A disruptive no-deal scenario could cause the pound to weaken further, pushing up import prices, and so the cost of living. Even a 5% drop in the value of sterling could cause inflation to be. about a half of one percent above the Bank’s target in two years time. 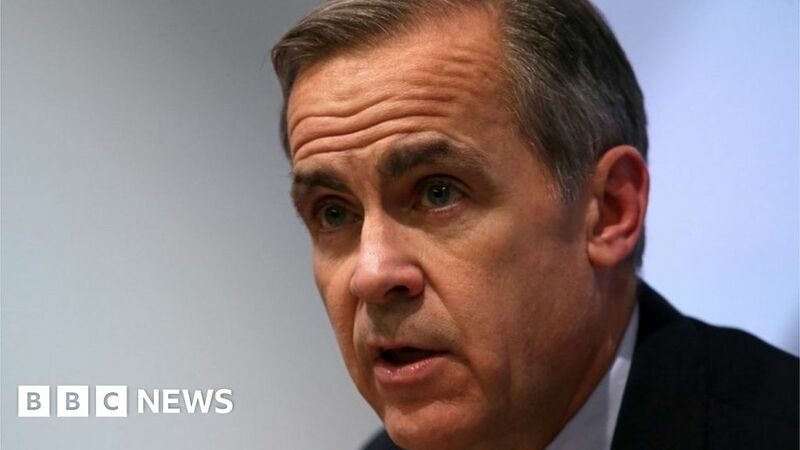 That – and a desire to restore confidence in sterling – might prompt it to raise in interest rates. On the other hand, the Bank reckons heightened uncertainty – for example in the event of a no deal – could knock growth down by around a third, to just 0.8% this year – and next. There’d be a temptation there to lower rates and support activity and jobs. But the Bank admits rates could move “in either direction”. It is keeping its options open. Whatever happens next, it is evident that activity has taken a knock in recent months, damaging prosperity. Despite the weaker growth outlook however, higher rates might still be looming if a deal is struck. The Bank has forecast that the recent improvement in wage growth will filter through the economy, pushing inflation above target in two years. It has, therefore, maintained its mantra of “slow and gradual” rate rises – if things pan out. But, for the moment, the rate setters hands are tied – like the rest of the world, all they can do is watch, and wait, as the latest act of the Brexit drama unfolds.